To ensure a BYOD policy that is end-user friendly without sacrificing corporate security, we would like to encourage Google Mobile Management customers to employ a mobile policy that keeps personal and corporate data safe. To that end, starting with Google Apps Device Policy v7.55 and above, the default enrollment process will utilize a work profile for those customers that have enabled Android at work and are whitelisting apps in managed Play, and for those devices that do support work profiles. Enrolling a corporate account allows your end users to access the managed Play store for curated and whitelisted apps, and provides a clear separation between corporate data and personal data to ensure that IT does not accidentally remove personal data from the device. Your users will still be able to opt-out of using a work profile and continue with the previous method of enrollment, if your corporate policy allows this. For more details on whether this change will apply to your organization, or if you would like details on how to prevent work profiles from being used in your mobile deployments, please see the FAQs below and refer to the Help Center. This change will start rolling out on June 5, 2017 along with the release of Google Apps Device Policy app v7.55+. Will this enrollment change be the default for all Google Mobile Management customers? 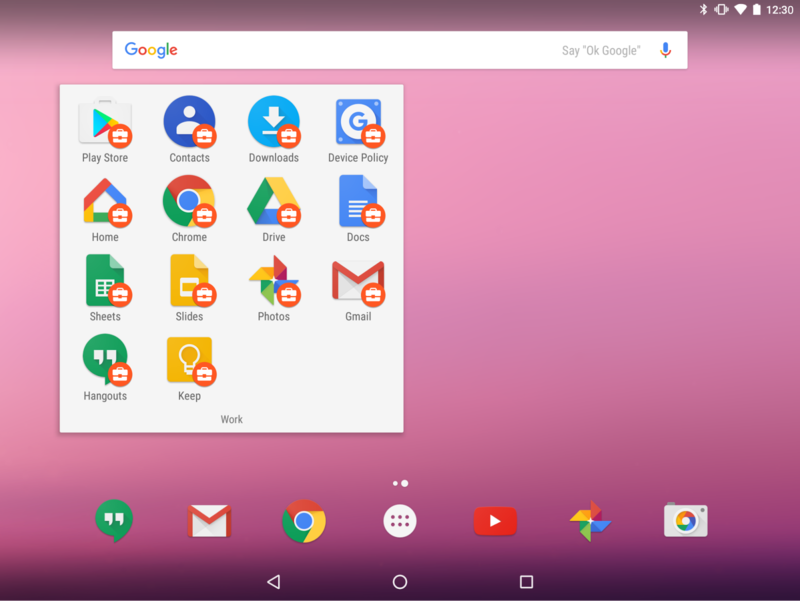 How do we know if the Android device supports work profiles? 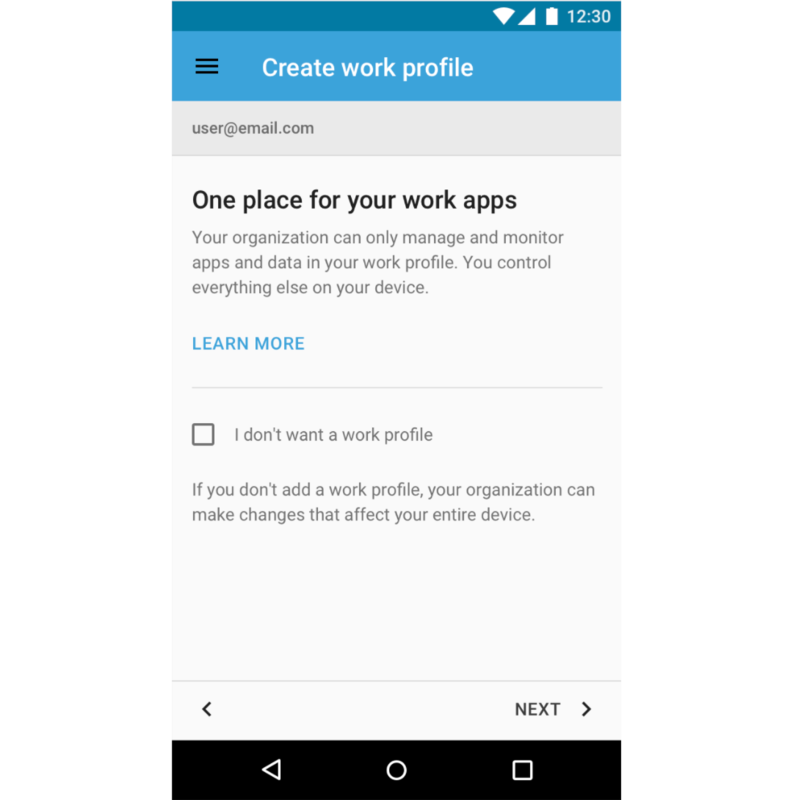 Android work profiles are supported on Lollipop (5.1), Marshmallow (6.0), and Nougat (7.0) devices, and any yummy future versions of Android. If you are looking to purchase new devices, please see the recommended list of Android Enterprise devices, or contact the OEM manufacturer of the device you are interested in. Our organization currently does not use work profiles, what are the advantages of using a work profile? For more details on work profiles and Android within the enterprise, please refer to the Android at work home page. We provide our employees with Company Owned Android devices. Does this change impact us? No. If you are already using Company Owned devices within Google Mobile Management, then this change will not be relevant to those devices. This change only applies to personal Android devices. We are upgrading our mobile deployment at the moment. Can we opt out of this change? Yes you can disable this feature immediately (without waiting for the new version of the Google Apps Device Policy app to be available). Note that this will prevent any user from enrolling in a work profile, and we encourage you to view the benefits of using work profiles in your organization as a way to keep corporate and personal data separate. Can my users access their corporate apps without a work profile? Yes. However, if your user has a device that supports a work profile, but does not use a work profile, they will not be able to access the managed Play store from their Android device. Thus these users will not be able to see the recommended apps that have been whitelisted for their organization. End users who are setting up eligible Android devices and whose organization policies allow it. Help Center: What is a work profile? As the use of mobile in the enterprise proliferates, and more and more enterprises are embracing mobile first strategies and policies, it is important that our G Suite customers who use Google Mobile Management as their enterprise mobility management tool (EMM) determine the policies that best protect their mobile users. This includes ensuring that corporate data stored on mobile devices is kept separate from end user data via the use of Android work profiles.